Chelsea fans took to social media to hail the technical ability of goalkeeper Kepa Arrizabalaga, who displayed great composure against Crystal Palace. The Blues secured a 3-1 Premier League win at Stamford Bridge on Sunday, thanks to a brace from Alvaro Morata and a 70th-minute Pedro strike. Maurizio Sarri’s men moved into the top two after 11 matches with the victory, further emphasising their credentials as title contenders this season. 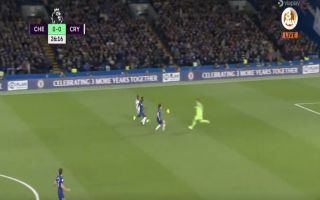 Despite a relatively quiet afternoon in terms of having to save shots, Kepa was praised by Chelsea fans on Twitter for his sublime passing skills, which he displayed in one sumptuous moment in particular against the Eagles. The Spanish ‘keeper came charging out of his area to meet a bouncing through ball on the half volley, firing it perfectly into the feet of his teammate in the opposition’s half. That interception and pass was a thing of beauty Swepa Kepa! ? Kepa the only keeper in the league who can charge out and make an inch perfect pass like that. As if Kepa just rushed out and drilled a Gerrard like pass to Pedro under pressure from his own CB and Zaha.